October 15, 2015 2B Tony Abreu assigned to Leones del Escogido. June 19, 2015 Rojos del Aguila de Veracruz released 2B Tony Abreu. April 28, 2015 Rojos del Aguila de Veracruz signed free agent 2B Tony Abreu. October 15, 2014 2B Tony Abreu elected free agency. August 23, 2014 Tony Abreu roster status changed by Fresno Grizzlies. July 31, 2014 San Francisco Giants sent 2B Tony Abreu outright to Fresno Grizzlies. July 29, 2014 San Francisco Giants designated 2B Tony Abreu for assignment. July 25, 2014 San Francisco Giants selected the contract of 2B Tony Abreu from Fresno Grizzlies. June 26, 2014 Fresno Grizzlies activated 2B Tony Abreu from the 7-day disabled list. June 20, 2014 Fresno Grizzlies sent 2B Tony Abreu on a rehab assignment to AZL Giants. May 23, 2014 Fresno Grizzlies placed 2B Tony Abreu on the 7-day disabled list. March 31, 2014 2B Tony Abreu assigned to Fresno Grizzlies. March 23, 2014 San Francisco Giants released 2B Tony Abreu. 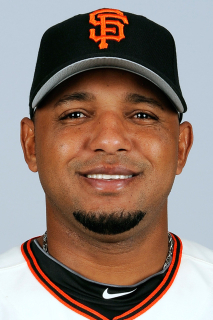 September 1, 2013 San Francisco Giants activated 2B Tony Abreu from the 15-day disabled list. August 12, 2013 San Francisco Giants sent 2B Tony Abreu on a rehab assignment to Fresno Grizzlies. July 29, 2013 San Francisco Giants placed 2B Tony Abreu on the 15-day disabled list. Sore left knee. June 8, 2013 San Francisco Giants activated 2B Tony Abreu from the 60-day disabled list. May 29, 2013 San Francisco Giants transferred 2B Tony Abreu from the 15-day disabled list to the 60-day disabled list. Quad strain. May 3, 2013 San Francisco Giants sent 2B Tony Abreu on a rehab assignment to Fresno Grizzlies. March 30, 2013 San Francisco Giants placed 2B Tony Abreu on the 15-day disabled list retroactive to March 22, 2013. Quad strain. February 4, 2013 San Francisco Giants claimed 2B Tony Abreu off waivers from Kansas City Royals. January 25, 2013 Kansas City Royals designated Tony Abreu for assignment. August 6, 2012 Kansas City Royals selected the contract of 2B Tony Abreu from Omaha Storm Chasers. December 1, 2011 Omaha Storm Chasers signed free agent Tony Abreu. December 1, 2011 Kansas City Royals signed free agent 2B Tony Abreu to a minor league contract and invited him to spring training. November 2, 2011 2B Tony Abreu elected free agency. August 21, 2011 Reno Aces activated 2B Tony Abreu from the 7-day disabled list. August 12, 2011 Reno Aces placed 2B Tony Abreu on the 7-day disabled list retroactive to August 10, 2011. March 30, 2011 Arizona Diamondbacks sent 2B Tony Abreu outright to Reno Aces. September 1, 2010 Arizona Diamondbacks recalled Tony Abreu from Reno Aces. August 4, 2010 Arizona Diamondbacks optioned Tony Abreu to Reno Aces. June 15, 2010 Tony Abreu roster status changed by Arizona Diamondbacks. June 11, 2010 sent 2B Tony Abreu on a rehab assignment to Reno Aces. May 25, 2010 Arizona Diamondbacks placed 2B Tony Abreu on the 15-day disabled list retroactive to May 24, 2010. Left wrist sprain. October 16, 2009 2B Tony Abreu assigned to Aguilas Cibaenas. October 9, 2009 Los Angeles Dodgers traded 2B Tony Abreu to Arizona Diamondbacks. August 27, 2009 Los Angeles Dodgers optioned Tony Abreu to Albuquerque Isotopes. August 19, 2009 Los Angeles Dodgers recalled Tony Abreu from Albuquerque Isotopes. August 9, 2009 Los Angeles Dodgers optioned Tony Abreu to Albuquerque Isotopes. August 7, 2009 Los Angeles Dodgers recalled 3B Tony Abreu from Albuquerque Isotopes. June 26, 2009 Tony Abreu assigned to Albuquerque Isotopes from Chattanooga Lookouts. June 23, 2009 Chattanooga Lookouts activated 2B Tony Abreu from the 7-day disabled list. June 23, 2009 Tony Abreu roster status changed by Chattanooga Lookouts. June 6, 2009 Chattanooga Lookouts placed 2B Tony Abreu on the 7-day disabled list. May 5, 2009 Chattanooga Lookouts signed free agent 2B Tony Abreu. April 9, 2009 Chattanooga Lookouts placed 2B Tony Abreu on the 7-day disabled list.